Here are some similarities between these two implementations of java.util.Set interface from Collection framework. Both HashSet and TreeSet implements Set interface. Both class don't maintain insertion order of elements . Both classes don't allow duplicate elements, add() method reject them by returning false. Both classes are not shared between multiple threads and not synchronized. Iterator of both TreeSet and HashSet are failed fast.They will throw ConcurrentModificationException if the Set is modified once the iteration begins. Both classes implement Cloneable and Serializable interface, which means you can serialize a TreeSet and HashSet and save int into the disk or send over the network to other JVM. You can also check Java Programming Interview Exposed by Markham for more of such questions from Java developer interviews. 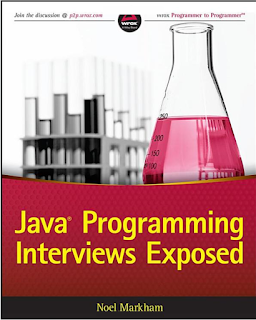 One of a complete book for getting prepared for Java JEE interviews. Now let's see some differences between these two classes, this will help you to decide when to use TreeSet and HashSet class in Java. HashSet internally uses HashMap to store its element, while TreeSet uses TreeMap to store its element internally. See this article to learn more about how HashSet works in Java. HashSet is unordered when we store objects in HashSet it stores then in random order, means if we want to print the element by using its Iterator, their order does not guarantee that the first element we inserted will be printed first. But in the case of TreeSet, the order of elements are defined by supplied Comparator, and if you don't give any Comparator for TreeSet objects then it will use natural ordering of elements e.g. Integers in their numeric order or String in their alphabetic order. HashSet allows maximum of one null element, which means you can store only one null value inside HashSet. But TreeSet won't allow any null object and you will get NullPointerException if you try to store null values in TreeSet. Why? because TreeSet sorts element as soon as you add it into TreeSet, if the object is null then calling compareTo() on that will throw NullPointerException. HashSet uses equal() and hashcode() methods to compare the elements, while TreeSet we can implements compareTo() method of Comparator interface so we have compare() and compareTo() method ,TreeSet does not use equal() and hashcode() method. HashSet is faster than TreeSet for all general purpose .The add, remove and contains methods has constant time complexity O(1) for HashSet, which means HashSet offers constant time cost for adding, removing and checking if an object exists in Set. TreeSet performance is less as compared to HashSet as TreeSet has to sort the element after each insertion and removal Operation. TreeSet offers log(n) time cost for dd, remove, and contains operations. TreeSet offers sorting which is not provided by HashSet. HashSet also has less methods as compared to TreeSet. 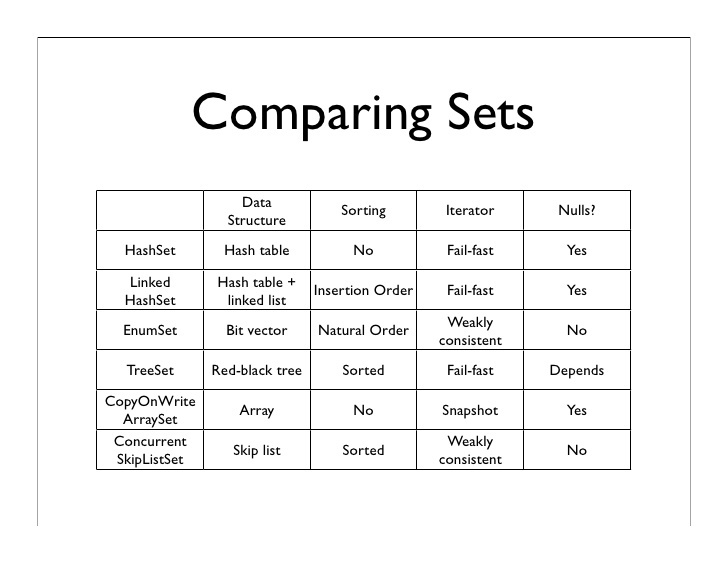 TreeSet is rich in functionality as compare to HashSet. Functions like pollFirst(), pollLast(), first(), last(), ceiling(), lower() etc makes TreeSet rich in functionality wise. So the conclusion here is which class we should use is totally depends on upon our nee. If we want to sort the element according to our need use Comparator and this is possible in TreeSet only but if we are looking for fast and better performance we should go for HashSet and also if we don't want to maintain order. TreeSet uses Red- Black tree algorithm underneath to sort out the elements. When one need to perform read/write operations frequently, then TreeSet is not a good choice. So that's it about HashSet and TreeSet in Java. In hashset heterogenous s are allowed where as in treeset heterogenous objects are not allowed..